A 4-year-old girl with a history of asthma who was referred to the allergy clinic after the development of several episodes of eye and lip swelling, throat tightness, vomiting, and urticaria within 10 min after eating pumpkin seeds. There was no history of shortness of breath, voice hoarseness, or fainting. Her symptoms started to spontaneously improve within 2 h without medical intervention. Her medical history revealed that she could tolerate peanuts, milk, eggs, and many fruits and vegetables including pumpkin itself. Her family history was positive for asthma but not for food allergies. Prick-to-prick skin testing was done for the patient to test for a pumpkin seed allergy. Skin prick testing using a control (normal saline) revealed a 3-mm wheal, whereas it revealed an 8-mm wheal in response to histamine. Skin prick testing using pumpkin seed showed a 9-mm wheal after 15 min [Figure 1]. This highly supported an immunoglobulin E (IgE)-mediated anaphylactic reaction secondary to pumpkin seeds ingestion. Due to the clear history and positive skin prick testing, we did not feel that an oral food challenge was necessary. Accordingly, the patient was instructed to strictly avoid pumpkin seeds and was provided an age-appropriate epinephrine autoinjector. Pumpkin (Cucurbita maxima) is a vegetable that belongs to the Cucurbitaceae family and has been increasingly incorporated into various foods. Unlike the other cucurbits such as melon or cucumber, allergies to pumpkin seeds are a rare occurrence. This report describes a girl who developed an anaphylactic reaction after she ingested pumpkin seeds. Pumpkin seeds contain large amount of proteins (35%) and unsaturated fatty acids (50%), tocopherols, and phytosterols. They are usually consumed as a snack or as an additive to bread or salads. Few case reports have described anaphylactic reactions that patients' acquired while carving a pumpkin after skin contact with pumpkin flesh and following the ingestion of pumpkin soup and a pumpkin cake. Pumpkin seeds are considered a very rare cause of food allergy; there have been only six reports in the literature of allergic reactions after ingestion of pumpkin seed,,,, five of which were described in adults,, and only one case report was described in a child. Doll et al. described a 70-year-old female who experienced anaphylactic shock with nausea, sense of impending doom, syncope, and hypotension that started within 10 min following ingesting pumpkin seeds which were included in a snack mix. Her skin prick testing revealed a 9-mm wheal in response to ground pumpkin seed mixture. Fritsch et al. 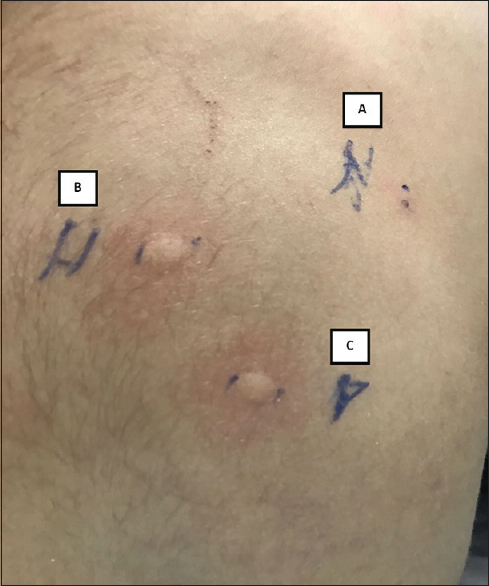 described three male patients aged 29–49 years who developed allergic symptoms ranging from itching and swelling in the oropharynx to bronchial asthma immediately following the ingestion of food containing pumpkin seeds. A positive reaction to skin prick testing was found in two of the three patients, and a specific IgE titer to pumpkin seed extract was positive in all three patients. Rodríguez-Jiménez et al. also reported a 33-year-old man with a history of several episodes of facial swelling, erythema, and shortness of breath 15 min after ingesting toasted pumpkin seeds. Skin prick testing also revealed a positive reaction for pumpkin seed. Caubet et al. reported the first and only known case of an allergic reaction to pumpkin seed in a child. They described an 11-year-old boy known to have atopic dermatitis who developed an anaphylactic reaction within minutes of ingesting pumpkin seeds. In this case, a prick-to-prick test with pumpkin seeds showed a negative response; however, the diagnosis was confirmed by a positive oral provocation test. The patient developed angioedema, urticarial, and asthma induced following the ingestion of 10 g of pumpkin seeds. Pumpkin seeds in snacks are considered to be popular and often consumed by children. In addition, they can be hidden in recipes or added to bread or salads. Our patient developed what can be considered an anaphylactic reaction. Therefore, it is necessary to consider allergies to seeds in snacks and should be aware of pumpkin seeds as a possible allergen that can lead to detrimental effects such as anaphylaxis. To the best of our knowledge, our study reports the second case in the literature of a child with an anaphylactic reaction following the ingestion of pumpkin seed. The final diagnosis is IgE-mediated anaphylactic reaction secondary to ingestion of pumpkin seeds. Pumpkin seeds in snacks are popular; therefore, it is necessary to consider them as a potential cause of IgE-mediated anaphylaxis that general practitioners should be aware of. Fritsch R, Ebner H, Kraft D, Ebner C. Food allergy to pumpkinseed – Characterization of allergens. Allergy 1997;52:335-7. Patel A, Bahna SL. Hypersensitivities to sesame and other common edible seeds. Allergy 2016;71:1405-13. Rodríguez-Jiménez B, Domínguez-Ortega J, Ledesma A, González-García JM, Kindelan-Recarte C. Food allergy to pumpkin seed. Allergol Immunopathol (Madr) 2010;38:50-1. La Shell MS, Otto HF, Whisman BA, Waibel KH, White AA, Calabria CW, et al. Allergy to pumpkin and crossreactivity to pollens and other foods. Ann Allergy Asthma Immunol 2010;104:178-80. Figueredo E, Cuesta-Herranz J, Minguez A, Vidarte L, Pastor C, De Las Heras M, et al. Allergy to pumpkin and cross-reactivity to other cucurbitaceae fruits. J Allergy Clin Immunol 2000;106:402-3. Doll R, Johnson J, Peppers BP, Tcheurekdjian H, Hostoffer R. IgE-mediated anaphylactic shock caused by pumpkin seed in an adult. Ann Allergy Asthma Immunol 2017;118:377-8. Caubet JC, Hofer MF, Eigenmann PA, Wassenberg J. Snack seeds allergy in children. Allergy 2010;65:136-7.